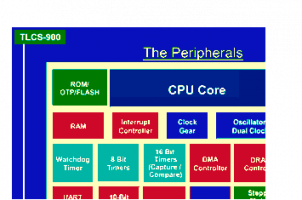 A lot of Non-Ethernet-Devices work with the TLCS900-Processor. Optimizing ANSI-Cross-C-Compiler for the TLCS900 running under MS-DOS. Supports 64/80bit floating point operations, #pragmas for stack checking, argument passing, and loop optimization. Special functions are provided for interrupt processing and immediate assignments to processor registers. TLCS900-ANSI-C-Compiler/Assembler with floating point support (for Windows). TLCS900-ANSI-C-Compiler/Assembler for Windows with floating point support. Evaluation edition limited to 3000 lines of source code - more than enough for even medium sized control projects. CD only with handbooks in PDF format, no support, no updates. Comes also free of charge bundled with mCAT developers licence. Only sold together with ELZET80 TLCS900 based hardware. To program this processor in the "C" language from your Windows-PC requires a so called "Cross- Compiler" , i.e. 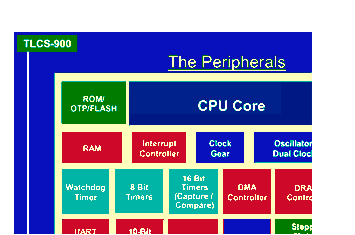 one that runs on an 80x86 type processor (your PC) and produces code for a TLCS900 (your industrial hardware). To encourage the use of the TLCS900, TOSHIBA offers for free a version of the ANSI-C-Compiler with limitation of 3000 lines. For the professional user there is also a full version of the ANSI-C at an attractive price. To write a program to run on for instance the TSM-CPU900 under mCAT, it requires the steps in the following table. The shaded section is covered by the tools in TOSHIBA´s C-Compiler packages, a downloader is part of mCAT and of most standard terminal programs. For downloading the terminal program is required, e.g. the mCAT included LGO. mCAT is delivered with the utility "VMAKE" , that automates the compilation process from source to the downloadable .shx-file. This is the appropriate compiler for professional use in large software projects. The object format is compatible with IEEE695. The ANSI-C compiler produces assembler source as an intermediate format that can be useful for optimizing and debugging. More informations available at the Developer-Homepage of Toshiba.